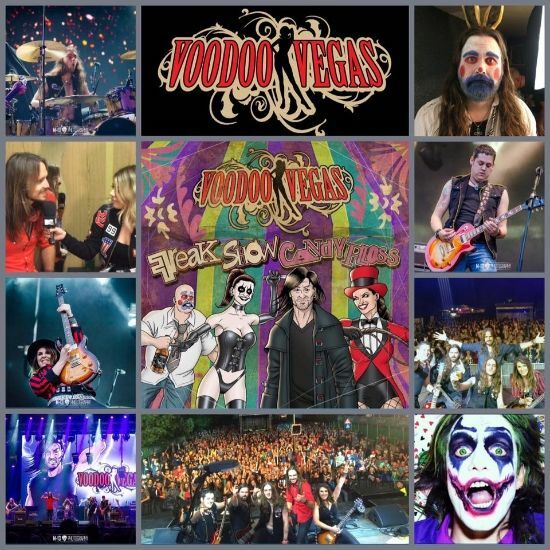 Voodoo Vegas recently released their latest album called “Freak Show Candy Floss” (http://www.rockradioni.co.uk/back-stage/music-reviews/2919-ni-rocks-recommends-qfreak-show-candy-flossq-by-voodoo-vegas.html ). I’ve been a supporter of the band for a while and posted an interview with them back in June 2013, so I thought it’d be a good time to catch up with them again and have a chat about the new album and what plans the band had for the future. I spoke to singer Lawrence and guitarist Meryl via Skype on 28 November and the interview was featured on the Friday NI Rocks Show that was broadcast on Friday 2 December. We’ll post a transcript of the interview here later. Voodoo Vegas are Lawrence Case on vocals, Meryl Hamilton on guitar, Ash Moulton on bass, Jonno Smyth on drums and Jon Dawson on guitar. NI ROCKS – Hi Lawrence and Meryl, thanks for taking the time to answer a few questions for Rock Radio NI. You recently released your latest album “Freak Show Candy Floss”. Where did you record the album and who did you work with? LAWRENCE – We recorded the album at the Los Rosales Studio north of Madrid. The producer was Will Maya who recently worked with The Answer. He has worked on pretty much all of The Answer’s albums in some capacity. He produced “Raise A Little Hell” and all of that. It was great for us to work with Will and we’d previously worked with him on the “Hypnotise” EP which we’d released before “Freak Show Candy Floss”. NI ROCKS – The first album was recorded at the legendary Rockfield Studios. Was it considered again this time or had you wanted to do something different? LAWRENCE – We did look at Rockfield again but Will had his own studio about 40 miles north Madrid. We did look at options to record it in the UK, but then we liked the idea of going away. When we recorded “The Rise of Jimmy Silver” at Rockfield we went away from home for two weeks. To go over to Madrid and be in Spain was entirely different to being in a tiny little town. Six or seven thousand people life there (Moralzarzal where Los Rosales Studios is) and it’s a completely different atmosphere. To get away and record in a real Spanish town, not a tourist place, was really something. I think we’ll always look to get away to record music, not just do it at home. It’s just great to get away. NI ROCKS – A bit of sunshine too! LAWRENCE – Yeah, well the weather was a bit pants at the start, but then it got all sunny and nice. It is a completely different culture over there compared to here. It was great to go over there and do that and I think, when we do the third record, we’ll probably think of going there again. NI ROCKS – You’d ran a Pledge campaign again for the new album. What do you think of that approach to funding new releases? LAWRENCE – I think it’s a great idea to get your fans involved. They get to be part of the album – behind the scenes videos and everything. NI ROCKS – It must be nice knowing that you’ve got that fanbase to take you well past 100%? LAWRENCE – They did yeah! In 12 days. It was great to do that. It was a bit different this year – they must have changed it. Last year there was a 90 day time limit, but this one went on for a long, long time. From March right through to September. It’s quite hard in the middle to keep people interested in it. I think it’s the same with any crowd-funding thing. It gets really busy at the start, in the middle it dies down and at the end it all picks up again. It’s great to get people involved and we’re very thankful to everybody who pledged. Thank-you! NI ROCKS – Yes, I was one of them. Had you been writing tracks for the new album for a couple of years or was there an intensive writing period pre studio time? LAWRENCE – We started writing the album in May last year (2015). We’d finished recording “Hypnotise” and we were thinking of doing it as a five track EP and then doing another EP, but we realised that was a bad idea (laughs). We’d done the EP as a sort of introduction to the new line-up of the band. With this record it was like a new band had got together, because the “Hypnotise” songs were written with the old line-up. With the “Freak Show Candy Floss” songs it was all new songs and lots of creative energy. It was like a brand new band trying to write an album. We were so quick – we wrote all the songs between May and September last year. NI ROCKS – Is there a standard approach to writing the tracks or do they come together in different ways? LAWRENCE – Usually Meryl and me get together and we wrote a song called “Black Heart Woman”. MERYL – That’s right, yeah. I came up with the riff first and then Lawrence added the lyrics to it. LAWRENCE – We got together to write that track, but a lot of the times it is me with Meryl, Ash or Jon and we come up with a basic idea. We do it on the Garageband or computer programme and get a rough idea to take to the band room where everybody puts their ideas in. A lot of the influence came from Will as well. He sort of became the sixth member of the band for the period of writing the record. We definitely had lots of ideas in there. NI ROCKS – I know that there are no cover versions on the album, but have you given any thought to recording cover versions? LAWRENCE – We haven’t thought about it recently, but years ago we got offered the chance to be on a Motorhead tribute album and we recorded; although I’m the only person left in the band who was on that, we recorded “Born to Raise Hell” for an album called “St Valentine’s Day Massacre”. There were lots of bands from all over the world on it and we were the only British band on it. A chap called Alan Burridge put us forward to the record label. When he was writing the liner notes for the album; he is Motorhead’s biographer, he said you’ve got to have a British band on there. The record label were happy to have us on there. We recorded “Born to Raise Hell” with about two days notice. I don’t think I even heard much of the songs to be honest. It was great though and I’d love that opportunity again to be honest, to be on a tribute album to a band. NI ROCKS - Do you ever play any cover versions as part of the live set? LAWRENCE – We play “Rock In the Free World”. That normally goes down quite well. MERYL – It’s a crowd pleaser that one. LAWRENCE – Before we had the songs for the second record we also played “Come Together” as well. The Aerosmith version of it. Or sort of our version mixed with the Aerosmith version. But now we’ve got the second album, we’ll generally only play “Rock in the Free World”, but not all the time as we’ve got our own stuff. NI ROCKS – The first single from the album was “Killing Joke” which you released a video for. It looked like a lot of fun. Who did you work with on that? LAWRENCE – We worked with my friend Richie Adams – he’s not a production company or anything. He is in a band called The Dirty Shingles if you want to check them out! He knows all the video techniques and I’ve known him for years and he is one of my best mates. We worked with him and worked together on all the shot ideas. A lot of the ideas were my ideas. Basically , I had this whole plan, as the song was about The Joker, to do a video where I turn into The Joker. We worked so well together. I grew my beard out for about eight weeks and had to get it shaved off during the video. It was great and a lot of fun. The whole putting make-up on thing was fantastic. A completely different sort of thing. A lot of bands do videos where they’re standing on a rooftop, in a forest or an old building. I just wanted to do something different and make people watch it from start to the end, thinking where is this going? And I think that’s what we’ve done. NI ROCKS – We’ll play a track from the new album now. Do you want to pick one and tell us something about it? LAWRENCE – Let’s pick one of Meryl’s favourites – “Resolution”. MERYL – Yeah, I love playing that one live. It’s really fun to play and very catchy. LAWRENCE –Track 3 from “Freak Show Candy Floss”. NI ROCKS – You’ve retained the Jimmy Silver character for the new album. What’s the story with Jimmy? LAWRENCE – He will always be on all of our front covers I think. He is our version of Eddie. I loved having him on the cover of the first album, then we had him on “Hypnotise” and then this. He is just always going to be there. 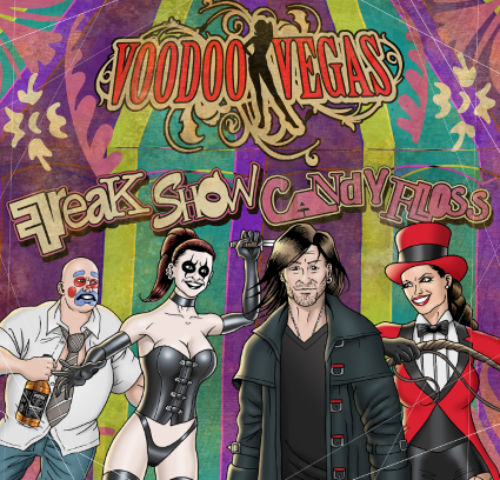 This time, if you look, Jimmy looks kind of normal on the front of the “Freak Show Candy Floss” album, but all the other characters have got elements of the songs. There’s the woman with the knives – that’s “Backstabber”. There’s the big fat clown man and he has a bottle that says “Poison” on it. And there’s the candy-floss lady – it’s great. We worked with Jim Boswell, a UK comic artist, to do the cover for us. 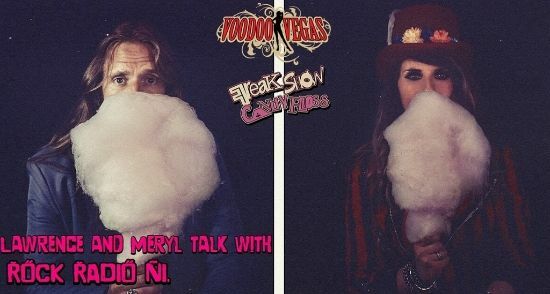 NI ROCKS – And I have to ask about the album title - “Freak Show Candy Floss”? What’s the story with that? LAWRENCE – In the summer we were doing mad stuff, like flying to Madeira on a Tuesday and getting back on a Thursday. Went there for a gig and came back into Heathrow on Thursday night; got into a van and drove to Germany to play a festival on the Friday night then drove back. It’s those sort of things where you’re travelling and going in a van for hours and hours and hours. Music people would understand that, but I’ve family and friends who say why would you do that – travel for 12 or 13 hours to play for an hour, then travel 12 or 13 hours back – you must be mad, you must be crazy. But we are; anyone who does what we do, you have to be a bit mad and crazy to sit around for all those hours, just to play for one hour. That’s the freak show side of it and the candy floss is that one hour when you’re on stage! It’s really great and you love it; then it’s gone, just like candy floss! NI ROCKS – That’s a good explanation! LAWRENCE – It’s the reason behind the album title – it might sound a bit weird but that’s why we decided to call it that. (Laughs). NI ROCKS – We did an interview back in 2013 and since then you’ve released the EP last year and obviously the album now. There are a couple of new band members. What else stands out for from the past couple years, as a band? LAWRENCE – I think when we played with Status Quo, that was great. I loved that. That was in 2014, and at the time, one of the biggest crowds we’d played to. It was amazing to get that gig with Status Quo. We only found out about it two or three weeks before and grabbed that opportunity with both hands. MERYL – That was great for me too and playing Slovenia was a dream come true. That was one of the biggest crowds we’ve ever played to and it had one of those massive screens the size of a house. I’ve always wanted to play with one of those massive screens. And also that day, we were on MTV Slovenia and the news and got to play with Joe Satriani, or support Joe Satriani! Lots of my dreams came true on one day, so it was amazing (laughs). LAWRENCE – It’s pretty crazy to go to Slovenia to play one show, but we got on their national news, their version of Sky News, and we were on MTV. It was massive. We’re planning on going back there next year. NI ROCKS – I know you’re booked to play the Hard Rock Hell AOR Festival in Wales next March, what else have you got planned over the next few months? LAWRENCE – We’re going to be announcing a lot of dates. We’ve been very busy booking shows taking us all over the UK. None in Ireland at the moment but we’re working on it. Hopefully some UK festivals and we’ve already got some continental shows booked for the summer. We’re going to be releasing another video at the start of the year. Get Christmas out of the way, then release the video and announce the shows that we’ve got. Then we’re going to do another video – a bit more in-depth for “Sleeping in the Rain”, the acoustic track on the album. That song seems to be getting a great response. NI ROCKS – Lita Ford is headlining the Friday that you play Hard Rock Hell. You’ll want to be hanging around for that I presume? LAWRENCE – I actually think that we’ll be on at the same time as Lita Ford! We’re on last on the same night as her on a different stage. So we’ll be on at the same time – I think that’s how it works! So people will have to decide Lita Ford or Voodoo Vegas! (laughs). NI ROCKS – I know from the website and the previous interview that you’re both Richie Sambora fans, and Meryl, you list Orianthi as an influence. Did you get to see them supporting Bad Company on tour recently? MERYL – No unfortunately! I’m such a silly sausage! A friend of mine offered me a free ticket, but I didn’t see the message until 4 days after the gig. But I should have gone, and didn’t! LAWRENCE – Did you go to see them? NI ROCKS – Yes, we went down to Dublin to see them. They were very good. We’d seen them before, when they played here in 2014, as headliners. They were very good, though they got a bit of a slating on the tour. Sometimes I just think that’s the Bon Jovi fans just having a go! LAWRENCE – I’ve seen Richie, just playing himself, and it was amazing. It was good to see him just go out there and do his own thing without the Bon Jovi influence. Obviously he played some Bon Jovi songs, but he was amazing. He is such a great singer too – that’s one of the best things about Richie Sambora playing solo, is that you can hear him singing by himself. Brilliant. NI ROCKS – We’ll get back to the new album mow and play another track. Do you want to pick one and tell us a little about it? LAWRENCE – I mentioned it earlier and there will be a video. It’s track 8 on the album – “Sleeping In The Rain”. It’s a song Meryl and me wrote together. Oddly enough the song came to me in a dream! We had to write another song for the album, as we only had nine and we wanted ten. I was messaging Will, asking what he thought about doing an acoustic track. I remembered the week before Will coming down and Meryl was saying we haven’t got an acoustic song, why are you arranging to do a song with him? I went to sleep one night and woke up and this song was just in my head. I had the guitar parts, the vocal melodies, everything together and because I can’t play guitar I got Meryl to play the guitar parts that were in my head. It’s one of my favourite songs and it’s about homelessness and I often try to help out homeless people. You go out into town and you see hundreds of people walking past the homeless people and don’t even say hello. Homeless people say the worst part is just being ignored and the lyrics are very much about them being ignored and being left out there – “Sleeping in the Rain” as the chorus says. NI ROCKS – We mentioned earlier plans to announce some gigs in 2017, but overall what would you have hoped to have achieved with the band by this time next year? LAWRENCE – I would like to play some mainstream UK festivals. I know we’re doing Hard Rock Hell, but I’d like to do what are considered as the mainstream UK rock festivals. We’ve been going a long time and have never done it – and I really, really want to do that. I really hope we get to do that because we’ve done some great stuff abroad. Like Meryl said – 8,000 people in Slovenia. But we’ve never done what I would consider a mainstream UK rock festival. Keep working hard and hopefully that’ll happen next year. NI ROCKS – What about getting back into the studio. Any plans? LAWRENCE – Yes, we’ll be doing that as well I think. Probably towards the end of the summer. Gig this album and we’re already writing some songs for the third record. NI ROCKS – Another album or an EP? LAWRENCE – Definitely an album. The EP was more to introduce the new Voodoo Vegas line-up and get us back out there. We’ll definitely be doing a third album. NI ROCKS – Has the band sold many records overseas in places like America and Japan or do you get much social media contact from people over there? LAWRENCE – Not so much from Japan, just a few messages. From America we do. From the Pledge we were sending a lot of albums out to America and Canada. We sent 3 or 4 CDs out to Beverley Hills! For a band from the south coast of England to be posting CDs to Beverley Hills is a bit mad! There was a lot from America for the pledge campaign. That would be the dream wouldn’t it? To go and play in America. Or in Japan. I’d love to do that! NI ROCKS – I guess the organising of it all is a problem! NI ROCKS – On the band’s website each of the band members mention some of their influences – I see you both mention Aerosmith. Are you planning to see them on tour next summer? LAWRENCE – I’m in the fan club and came to Dublin to watch them play back in 2007. That was amazing. I was right at the front. I’ve always said to myself that I won’t go to Download unless Voodoo Vegas are playing so I won’t be going there. Hopefully we’ll be playing there – you never know! If we don’t play, I won’t be going there, but I’ll definitely go see them somewhere. I love those guys and they’re a huge influence on me. MERYL – Yeah, I’m planning on catching a date with them – maybe in Europe I reckon. LAWRENCE – Yeah, I will definitely go watch them play. I love them. They’re a huge influence on my musical career. NI ROCKS – Someone mentioned to me that they were playing Geneva at the start of July and that you can get cheap flights to Geneva apparently! LAWRENCE – Really! That would be good. Though you get cheap flights to Spain too! NI ROCKS – I always like to find out what music people have been listening to recently? What was the last album you bought and last gig that you went to? MERYL – I went to see Black Stone Cherry in Portsmouth on Monday and they were amazing. NI ROCKS – They’re excellent, yeah! MERYL – They’re really good. I love them. I think the last album I bought was the Monster Truck album. They’re really good. NI ROCKS – Yes, I saw them supporting Nickelback recently and they’re coming back here in March as well actually. MERYL – Yeah, I’d love to catch them live as I haven’t actually seen them. I’ve just listened to their album and that’s really good. LAWRENCE – The last person I went to see live was Jack Garratt. I’d never heard of him but it was quite interesting to go and watch him with my cousin. It’s a completely different world to the rock world. Very interesting. It wasn’t really my cup of tea. The other person I saw was Pat McManus – he was amazing. So good. We saw him in Southampton and he was only playing to probably 40 or 50 people maybe, but he was playing like he playing Wembley Stadium. He was loving it and there was a huge smile on his face. I think you’ve got to do that and enjoy being on stage – if you don’t you shouldn’t be on it. And he clearly did enjoy it – it was brilliant to watch him. NI ROCKS – As we’re almost in December, if Santa was listening in what music related gift would you want? I’m sure you never have enough guitars Meryl? LAWRENCE – I think I’d like some in-ear monitors, which would be nice. Or a wicked, good microphone for my harmonica. LAWRENCE – If you know Santa, Nigel please let him know. We’ve both been quite good this year. NI ROCKS – And going back to my earlier question about cover versions. If someone was putting together a rock Christmas compilation, what track would Voodoo Vegas do? LAWRENCE – I would like to do “Please Come Home For Christmas” because I like Bon Jovi. As a singer I’d like to be able to sing that song. Also “I Wish it Could be Christmas Everyday” or something like that would be good. MERYL – “Mistletoe and Wine” for me (laughs). NI ROCKS – That’s enough silliness now! Back to the new album to finish off. Again, I’ll let you pick a track to play and tell us something about it. LAWRENCE – Let’s do a bluesy one. A song called “Poison”. It’s about a trip we went on to a festival in Belgium. I’m not a drinker at all, but that day I had a few Mr Daniels and he certainly punished me the next day! It’s not one of those songs to say go out drinking – it was horrendous! One of the worst nights of my life! This song is about that trip and it’s called “Poison”. NI ROCKS – That’s great, we’ll play that. Thanks again for taking the time to talk to Rock Radio NI. Best of luck with the new album and best wishes for 2017. Hopefully we’ll see you over here sometime soon.